We regularly review technical books, and occasionally we like to give a thumbs up to the most interesting ones we see. This is the case for “PowerShell in a month of lunches” by Don Jones ( http://www.amazon.com/Learn-Windows-PowerShell-Month-Lunches/dp/1617290211/ref=sr_1_1?s=books&ie=UTF8&qid=1317110718&sr=1-1 ). Don’t let the title fool you, this is not a “for Dummies” book. Don Jones not only does a great job teaching PowerShell, he also is great in demonstrating how to learn PowerShell, a subtle but big difference. And: Is Google really better than Bing? Written by: Margriet Bruggeman, Nikander Bruggeman. Heads up, a slight warning, the technical good stuff comes later, we’ll start indulging ourselves with a little “amuse cerveau” (amusement for the brain, if you’ve never heard of the term that’s okay, we just mixed two French words together). 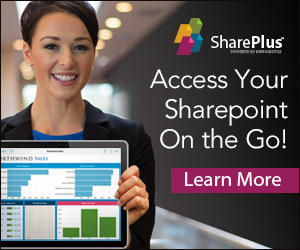 We’ve been writing blog posts about SharePoint for years now, and the most popular one we’ve ever written was “Exploring the Data View Web Part”, currently located on our new web site at http://www.loisandclark.eu/Pages/dvwp.aspx . This apparently was and still is a popular topic among SharePoint aficionado’s and it helps that this particular blog post turns up high in search results. Aha, if you forget the advertising, you’ll agree that our blog post shows up as the fourth result. Therefore, our temporary scientifically proven conclusion is that Google is 4 times better than Bing, we’ll see later if it stays that way. We have written other blog posts that we consider to have been very successful because they gained us new customers offering interesting projects. An example of such a blog post is “Velocity: Solving a Spider-Man/Human Torch dilemma”, currently located at http://www.loisandclark.eu/Pages/Velocity.aspx . Being free contractors, such posts are kind of a big thing and they certainly don’t happen all of the time. Then there are (luckily a few) blog posts that backfired in unexpected ways. In “Fast Search Server 2010 for SharePoint: brief discussion”, currently located at http://www.loisandclark.eu/Pages/FastSearch.aspx , we talked briefly about SharePoint Search and the acquisition of Microsoft of Fast. Soon after it’s publication on May 1st 2010 we started seeing referrer URLs in our web logs leading to http://arnoldit.com/wordpress/2010/05/03/fast-search-server-2010-vision/ . Being curious, we read it and it was not exactly the kind of fan mail we were hoping for. Don’t you think it’s just nicer when people just get along? Anyway, if we ever get to rural Kentucky, we’ll make sure to find that Arnold geezer in his high-tech nerve center and give him a good kicking! As a side note, we have high hopes that the blog post we’re writing now might be a potential candidate for a bit of unexpected backfiring too. And then there is the blog post that we’re revisiting today, “Building a System.Transactions resource manager for SharePoint”, currently located at http://www.loisandclark.eu/Pages/transactions.aspx . 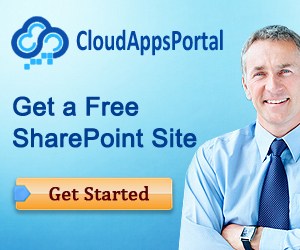 This blog post explains how to build transaction support into SharePoint for list items. Being 100% serious, this is hands down and by far the best thing currently written about that specific topic. However, this blog post has two problems. The first one is that almost no one bothers to read it! Why is that? There’s nothing wrong with it’s visibility. 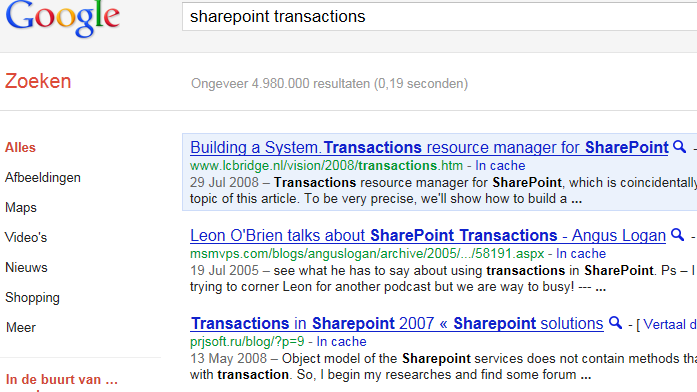 Look, if you go to Google and search for “sharepoint transactions” it shows up as the first result (still pointing to lcbridge.nl, a web site we’ll be discontinuing in a couple months). So, we put in the time and effort and write an 11,000+ words article (for comparison, a large MSDN article is up to 4000 words) that discusses exactly how to build transactional support using the standard SharePoint object model into SharePoint, and Bing thinks that that is less relevant than this little Q & A? We can go ahead and discuss the other results listed ahead of our poor neglected blog post, but the results would be very similar and our sadness would increasingly increase. Oh boy, if we ever come to Seattle again we’ll make sure to go to the Microsoft campus, find the Bing team in their high-tech nerve center and give them too a good kicking! Although we absolutely love Microsoft technology and recommend it to people whenever we can (did you know the Windows 8 pre-beta was released two days ago? 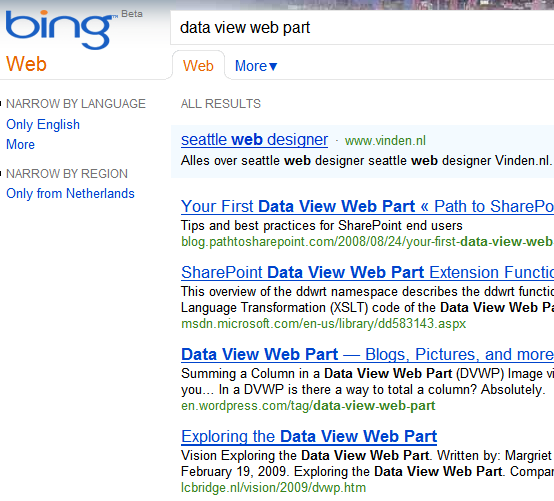 ), it pains us to say that we do feel that Google is better for searching than Bing. Transaction support for SharePoint list items is an esoteric topic that nobody is really interested in and that’s probably why Microsoft hasn’t bothered to build it in yet. Strangely enough, conclusion two doesn’t stop us from writing about transactions in SharePoint again. We said earlier that “Building a System.Transactions resource manager for SharePoint” had a second problem, and that’s the reason we’re revisiting this topic today. If you made it this far, it’s probably a good idea to browse through the original article at http://www.loisandclark.eu/Pages/transactions.aspx , otherwise the rest of this blog post won’t make much sense. A scarlet dragon rustles by, borne on winds of doom. And deep in the haunted mountains, the lost, black gods awake. For this is the Dragon’s Hour, the triumph of Fear and Night. We’ll be discontinuing our old web site, e-mail addresses, and blog at http://www.lcbridge.nl in a couple of months from now.